Parkway Marina is on Smith Mountain Lake Parkway a couple of miles past the State Park. The only charge for the event is a $10.00/car parking fee. Admission is free. There are plenty of food vendors and activities for the children. Also there is a beer garden for your enjoyment. This is THE major fundraising effort for SVFC, and we need your support to help better protect our community and its visitors. • Please, no pets, coolers or picnic baskets. Lawn chairs and/or blankets are recommended. • If you enjoy the fireworks by boat, or from another location, please donate to the fire company either by mail or online at smlfireworks.org or svfc-10.com. • Since 2001, Saunders Volunteer Fire Company has organized the event and provided manpower to handle the growing popularity of the annual celebration. • What sets this display apart from other major displays in our area is the setting. The reflection off of the lake and the reverberation off of the mountains significantly amplify the display. 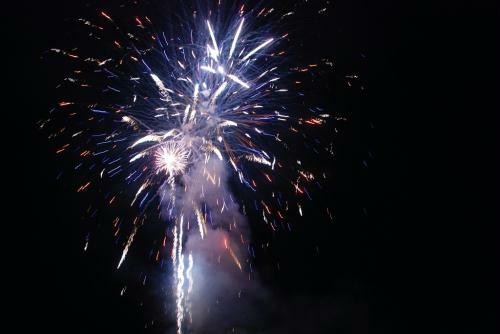 • Supplied by Zambelli International, supplier of major fireworks displays throughout the world. • Approximately 20 minute show averaging 1.5 shells per second. This is one of the largest displays in the region. • Approximately 5000 attended the event at the marina in recent years. • 3000-3500 boats observe from the water, as estimated by the Department of Game & Inland Fisheries. • Unknown numbers watch the event from other locations around the lake. • Arts & Crafts on display and for sale from our many vendors and sponsors.